I have 1" square porcelain (ceramic) tile, about 1/4" thick, on my bathroom wall that I was having problems drilling. I'm guessing it has a Porcelain Enamel Institute (PEI) rating of class V (class 5) and would rate at least a 7 on the Mohs hardness scale, since I couldn't scratch it with a normal high speed steel drill bit. I tried masonry bits, a Sears Craftsman Glass and Tile Bit (with a carbide tip shaped like an arrowhead), and the similar Black & Decker Glass & Tile Drill Bit, 5/16", but after a half hour was able to penetrate a single tile to a depth of only about 1/8". So I bought this ingenious bit, which is 2-3/16" in length. The 1" chuck end is smooth and round (which can slip if not seated tightly enough). It's 3/8" in diameter, so check that your drill can accept this size. The 1-3/16" length working end consists of a hollow cylindrical barrel tube. The far end of the barrel has diamond powder sintered onto its edge; the next 3/8" of the barrel has reverse flute threads on the outside; and the near end of the barrel has a 5/8" long slot on the side for "core removal ejection." The back and the front of the package have two important notes. First, the package states "only for use in cordless drills." Although I used a cordless drill, you could probably use a grounded or double insulated corded drill that can rotate at low speeds. Second, "for best results the drill bit requires water lubrication." 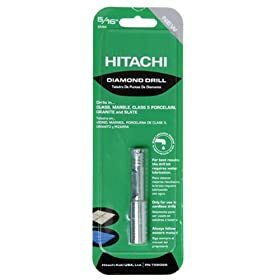 Hitachi offers a Drill Guide and Water Cooling System that I didn't buy; I simply dipped the tip in a cup of water every 10-15 seconds. Per the manufacturer's Web site, water on the outside allows "the reverse flute threads... [to] continuously supply water to the cutting edge, cooling the bit tip, and extending its life." You start by placing the drill head at an angle to the wall to create a crescent-shaped sort of "pilot hole" in the tile, then you gradually tilt the drill bit perpendicular to the wall to finish the job. WOW! After I got the hang of it, it took me only four minutes to drill through each tile. I'm not sure how many times the bit can be used, but I notice only very light wear on the diamonds after drilling six holes. This bit is worth every penny! 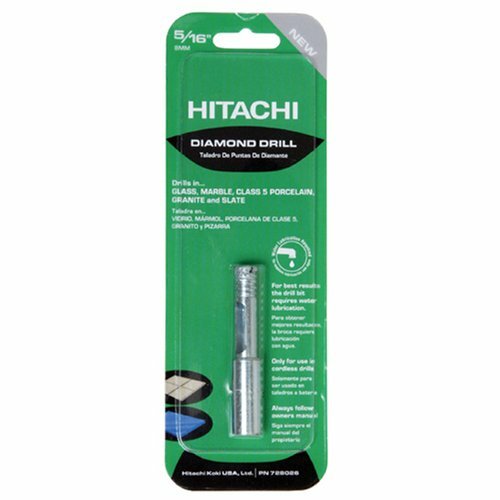 BTW, unlike the reviewer who complained that the Hitachi 729404 5/8-Inch Diamond Core Bit was actually 15mm instead of 5/8" (i.e., was almost a full millimeter less than 5/8"), this 8mm bit is only 0.063mm larger than 5/16". You have found the bit you are looking for! This is a very high quality bit that has been designed to do its job well. I had a need to drill holes in installed marble tile. Cracking a tile would mean a very expensive repair job or an unsightly patched crack. This bit drills nice smooth holes through 3/8" marble in about 2 minutes. It is extremely easy to drill on the floor since the water puddles up and only needs to be renewed every 15 - 30 seconds or so. I haven't tried it on the wall yet but I did buy the wall watering and guide kit (only about five bucks). The guide was useful on the floor also just to get the hole started in the right place (you should hold the guide in place with your fingers to help keep the suction cups from sliding around). Remember to clean out the "core" if it seems to stop making progress. Excellent product. I was surprised not to find any competitive products by the other big name tool manufacturers out there but that is probably because it is patented. I would say not to hesitate to order now unless you need the bits today. A big chain home improvement store with 5 letters that starts with an L and ends with an S has these bits in my local store for much less money.